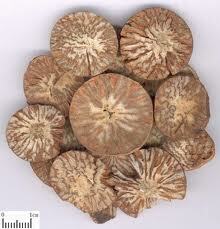 The dry ripe seed of the evergreen tree Areca catechu L. of family Palmae. Hainan, Fujian and Yunnan provinces in China. Collected in late spring to early autumn. Light smell, astringent and light bitter. Large, firm, and heavy with fresh-looking cross section. 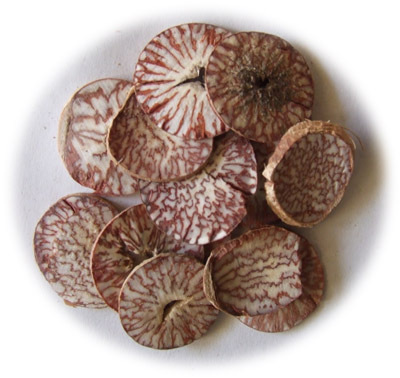 Boiled, dried and peeled, then dried in the sun; sliced after maceration or smashed. Bitter, pungent, warm; stomach and large intestine meridians entered. Expel parasites and promote digestion, move qi, induce diuresis. It can expel and kill a wide variety of intestinal parasites including tapeworm, roundworm, pinworm, hookworm, fasciolopsis and so on and it excels at expelling worm bodies by its purgative action. The ability of its purging down helps in expelling the bodies of parasites, best for treating taeniasis. It could be used singly or combined with herbs to promote flow of qi and alleviate pain, such as Mu Xiang in the formula Sheng Gong San from the book Zheng Zhi Zhun Sheng. It is mutually reinforced by Nan Gua Zi in modern usage. When combined with Shi Jun Zi and Ku Lian Pi, it is reinforced for treating ascariasis and enterobiasis. This herb is pungent and bitter with the actions of dispersing and purging, enters stomach and large intestine meridians, and is good at moving stomach and intestine qi, also purging mild and relaxing bowel, and promoting digestion and removing food stagnation. For indigestion and qi stagnation, abdominal distension and constipation and so on, it is often combined with qi-moving herbs and offensive purgatives. For instance, it is combined with Mu Xiang, Qing Pi, Da Huang and so on in Mu Xiang Bing Lang Wan from Ru Men Shi Qin. For damp-heat diarrhea and dysentery, it is also combined with heat-clearing and damp-drying herbs and qi-moving herbs. For instance, it is combined with Mu Xiang, Huang Lian, Shao Yao and so on in Shao Yao Tang recorded from Bao Ming Ji (Collection of life-protecting). This herb induces diuresis and moves qi that can help move fluid. For edema of excess syndrome and difficulty in urination and defecation, it is reinforced by the combination with qi-moving and diuresis-inducing herbs. For instance, it is combined with Shang Lu, Ze Xie, etc. in Shu Zao Yin Zi from Yan Shi Ji Sheng Fang (Yan's Saving Lives Prescriptions). For cold-dampness induced foot swollen and pain, it is often combined with meridian-warming and cold-dispersing herbs and damp-resolving and qi-moving herbs. For instance, it is combined with Wu Zhu Yu, Mu Gua, Chen Pi, etc. in Ji Ming San from Zheng Zhi Zhun Sheng. In addition, this herb checks malaria. For malaria it is combined with other malaria-checking herbs such as Chang Shan, Cao Guo, etc. Decoct 3~10 g. Take 30~60 g when expelling tapeworm and fasciolopsis. The raw is better than the stir-baked and the fresh is better than the old. It is contraindicated for loose stool due to spleen insufficiency or qi sinking. Use with caution for pregnant women.